Mick Thomas has been a mainstay of Australian music since the mid nineteen eighties, having released more than twenty records over his career as a solo artist, and with the band Weddings Parties Anything. 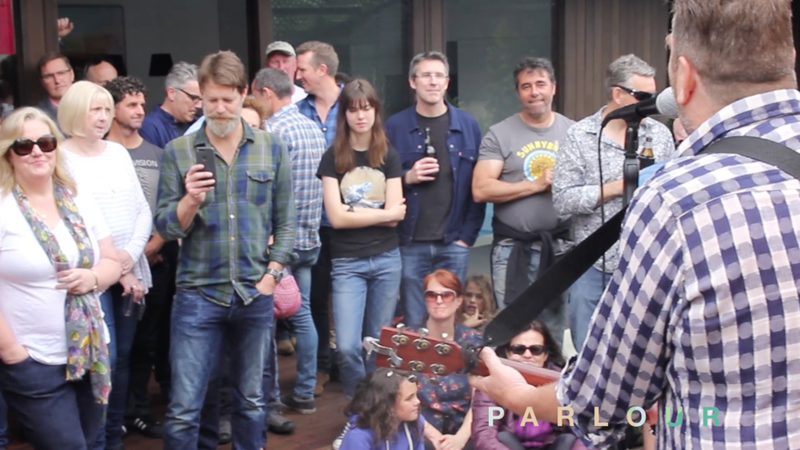 On a Sunday afternoon at Green Street in Cremorne, the local legend with a colloquial, folky delivery entertained an audience which was representative of many demographics. Though the sky was tinged with an ominous grey, the rain thankfully held off for the length of his performance on the stained timber deck by the pool in the backyard. The smell of barbecuing burgers wafted through the residence as afternoon drinks flowed, and a jubilant feeling hung in the air. The house, a gorgeous combination of modern and classical architecture, offered a terrific venue for the performance. The high ceilings, exposed brick and wooden beams across the roof melded perfectly with the uniquely Australian tones and local referencing of Mick Thomas' performance. Deep maroon leather couches in front of a fire place in the lounge provided a comfortable reprise for attendees, the sound from the stage still distinguishable. The gathered audience absorbed the performance with great respect - the beauty of a Parlour event is not only the intimacy of the show, but the lack of conversational noise pollution that tends to hamper live gigs in traditional venues. A hush stillness and absorption in the set seemed to sweep the outdoor congregation, and every face present was enthralled by the warm, lush tones of the accompanying violin, the gentle, smoky timbre of Mick Thomas' voice, and the spine-tingling two part harmonies throughout. The arrangement of the space was terrific, and attendees clearly found delight in revelling in the festivities. A true sense of community ran through the crowd, with many a smile being exchanged throughout. Children, teenagers, young adults and middle aged people were all made to feel welcome, allowing for an inclusive and homely experience. The inherently pleasant, laid back nature of a performance such as this was rather apparent. Even as the hush diminished in the back room, taken over by chatter, the deck remained a place of enthralled onlookers, who hung on to Mick's every word, and fell into the embrace of his gently plucked guitar. The occasional glimpse of a V Line or Metro train whizzing past the fence and the map of the Melbourne Botanical Gardens inside served to add a thematic tinge to what was a uniquely Melbourne performance. Mick Thomas, somewhat grizzled and weathered with striking blue eyes and stubble dotted with distinguished grey hairs, came across as easy going and friendly, the type of bloke you'd love to have a beer with. But as he sings through his lamentations on life and desire, he bares the soul of a poet - finding the delightful or the tragic in the pitfalls of every day life, and seeking the poetic in the prosaic. Even after his decades of performing, Mick's voice sounds crisp and strong, as if he hasn't aged a day since the eighties. A lyricist who clearly draws his inspiration from his own life and the people around him, the jokes he slips in about Westpac or Eddie Maguire don't escape the audience, who chuckle at each uniquely Australian reference. From having a friend making serious coin working in the mines to getting drunk on a Jetstar flight, the experiences relayed in his songs were all tangible, familiar and resonated with the audience. Sipping on a can of VB, the anecdotal stories Mick told between some of the songs were candid and delightful. Although the blanket of grey clouds became thicker and somewhat more menacing throughout the show, the jubilant nature of the audience and the friendly intimacy of the performance did not waver for a second. You couldn't ask for a better Sunday afternoon than a backyard barbecue accompanied by a seasoned performer like Mick Thomas. Quote From Mick Thomas: "The most difficult thing about our show at Green Street was finding a park and getting out through the maze of one way streets and cul-de-sacs. Everything else was easy. The gear seemed to want to work, and the crowd was receptive and spirited. If we wanted a drink or something good to eat that was no problem either. It makes you wonder why at some gigs everything seems so damned hard."